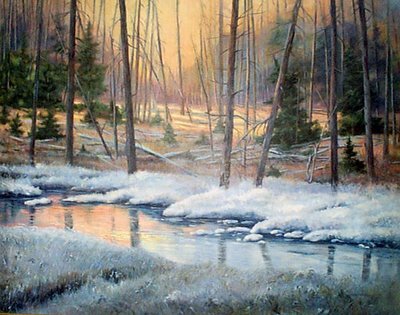 I came across this image of a painting that reminded me so much of home...especially during this time of year, that I just couldn't help feeling compelled to share it with you! I was born and raised in Michigan, and spent many of those years living in the countryside of a small town. I remember many a winter day and scenes like the one depicted in this painting that reminded me so much of home... The house that we lived in was on lake front property, surrounded by woods and a wide variety of wildlife. I used to ride my horse on the winding trails of the surrounding area and I remember a stream similar to the one depicted in the painting. It was nice to be momentarily carried back to a place in time that seems now so far away, and the memory of moments where I experienced serenity much like that captured in this wonderful painting. Sunrise Splendor Observing the beauty of Yellowstone [National Park of Wyoming, Montana, and Idaho, USA] unfolding in the early morning glow, sunshine warming last night's extremely heavy frost is a sight few are privileged to see. It's nice to have those memories when you need them the most!